Disclosure: I received a sample from Precious Moments in exchange for an honest review. All views shared are mine and mine alone. Have you put up your tree yet? Usually I put ours up a few days before Thanksgiving, but this year we put it up November 10th, as a birthday request from my youngest daughter. And, I am glad that I did, as it seems that Christmas is fast approaching -- only 38 days away. Boy, I know everyone keeps saying it, but it seems every year, the holidays creep up on us even earlier. Yes, I know they start playing Christmas music the day after Halloween, but I was watching Christmas movies on television even before the girls went trick or treating. And, now, I am seeing so many people feel the holiday stress of getting their shopping done or started, and we aren't even at Black Friday yet. Have you started an ornament collection for your kids? It really is a nice thing to do, and I look forward to each November when we put the tree up, as the girls reach into their ornament boxes and pull out the ornaments, and share stories about them, reminiscing about a lost tooth, when they did ballet or other sports, the first book they read, etc. Each and every ornament carries a story and puts a smile on their face, and mine. I can't lie, I find myself tearing up when they hang the ornaments as I realize they are growing up and becoming more and more independent, and one day they will be on their own. Hopefully when they put up their own Christmas trees and they pull each ornament out, it will bring back fond memories of their childhood, and the special moments that made me choose those particular ornaments for them. This year, I gave my oldest daughter the new "Wishing You a Cool Yule" 2018 ornament from Precious Moments. "2018 was one cool year and this adorable dated Christmas ornament features a little penguin eager to slide into the new year atop a pile of snow sculpted with “2018.” Purchase this tree decoration as a whimsical tribute to a year of wonderful memories with family and friends. It makes a thoughtful Christmas gift for teachers, coworkers, friends, family or anyone who has had a special year worth remembering." 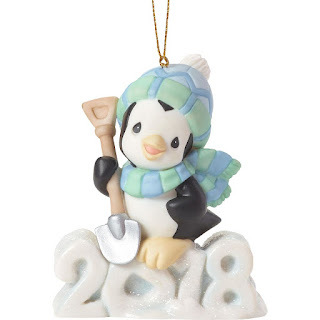 Precious Moments dated penguin ornament. I saw it the other day at our local Hallmark store and knew it was a perfect fit for her, as she fell in love with penguins when we learned about them in school, and even had the opportunity to touch one during a homeschool field trip to a nearby aquarium. She even brought home a painting done by the penguin, and has it displayed in her bedroom. So, I knew this would be a nice reminder of this one of a kind experience she had, and how it got her excited to learn all about penguins this year, beyond what we were learning about for school. Isn't this the cutest ornament you have seen? My daughter couldn't wait to find the perfect spot on the tree to hand this porcelain bisque ornament. She ended up hanging it near her Precious Moments 2017 black dog ornament in a stocking she received the previous year. Now, whenever she sits on the couch to watch television or read, I catch her sneaking a peek at her ornament and smiling, and it makes me smile to. To learn all about the different Precious Moments ornaments available, that would make for great gift ideas for Precious Moments fans, or to give for an ornament swap, or even to start an ornament collection for your child, head on over to www.PreciousMoments.com, or stop by a nearby Hallmark store today. And, while you are there, don't forget to check out their selection of figurines, which would also make great gift ideas this holiday season.